UPDATE 2016-11-02: Version 0.2! Updated, corrected and improved EXE edition, now with HTML5 version for browsers. Also updated the FLAC with correct tags. Why do I bother? 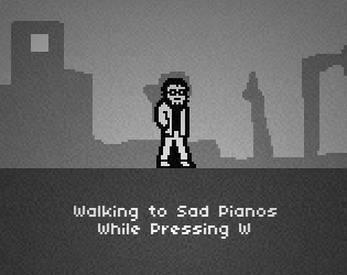 Walking to Sad Pianos While Pressing W is a pretentious waste of time and space. You are some beardman walking around a city. Then it ends. It's got achievements though. Kids like those. Walking to Sad Pianos was a mistake. Inspired by such "masterpieces" as Polygon's Game of the Year Gone Home, the actually great Stanley Parable, and the awful, awful, worthless piece of crap created by that non-dev FoldableHuman called Resist, which this game is a parody of, or something. I forgot what I was doing half-way through. Also, Michael Campbell (@EvilBobDALMYT) wrote for Super Nerd Land a review of the game, which is here. I feel as if I had vomited over a carpet, and people had stood around to contemplate the stain. Includes a FLAC version of "Theme from Sad Piano" by M Janet Mars. Download the EXE file or go to the top of this page. Open the game, or click on it if you're still here. Press W for a long time. Get to the end of the game.